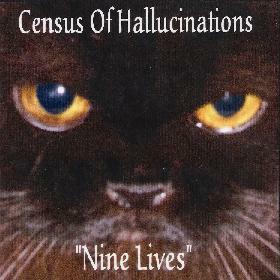 Census Of Hallucinations - "Nine Lives"
The album opens with an atmospheric spacey intro piece that leads into a cover that blends two Peter Green era Fleetwood Mac songs, "The Green Manalishi" and "Oh Well", done up with the indelible CoH stamp. Tim & Terri's vocals and trademark CoH sound are backed by very cool space waves, something that characterizes the entire album. Among the cosmic space journey tracks on the album is "Integration II", with its alien voice samples and narrations, freaky efx and a heavenly floating drift. On "Magna Matter", a hypnotic drone weaves a continuous path as tribal percussion sets the rhythmic pace, trippy guitar jams along and alien efx color the proceedings. "The Mental Minstrels" consists of over 10 minutes of freeform psychedelic exploration, with elements of Vangelis and Tangerine Dream, Ash Ra Tempel and much much more. CoH transition quite a bit throughout this one so I just went with the flow and tripped along with it. And "My God, It's Full Of Stars" features drifting, peaceful soundscapes, Ash Ra Tempel sounding guitars, jazzy saxophone and a generally cosmic psychedelic vibe that makes for a deeply meditative space mantra. I've harped ad nauseum over what extraordinary song writers Tim & Terri are, and of course no CoH would be complete without several examples of their beautifully cosmic brand of pop tunes. CoH songs are accessible but by no means simple, incorporating elements of psychedelia and progressive rock, along with careful studio manipulations to create something I consider to be pretty astounding. True craftsmen. There are 18 tracks on the album and lots of variety, but I also think this is one of the most consistent CoH albums to date. The songs are carefully connected so that each flows very smoothly into the next, however different the next may be. And the entire album is characterized by a deep-in-space quality that I struggle to describe because it's so unique to this very special band. Space Rock, Psychedelia, Progressive Rock and Pop all come together to form a recognizable CoH sound. I hesitate making analogies but space/psych fans looking for something different are sure to find Nine Lives to be an enchanting experience. And for the benefit of veteran CoH fans I'll say that I think Nine Lives is hands down their best album yet. Absolutely outstanding.